Komende Vrijdag 22 februari, 19:00 uur zal er een infoavond zijn in de wilde bollox, over de studente opstand in Montreal, Canada. Het wordt niet door de AGA georganiseerd, maar is wel erg interessant. Lees onderstaande introductie en hopelijk tot vrijdag. 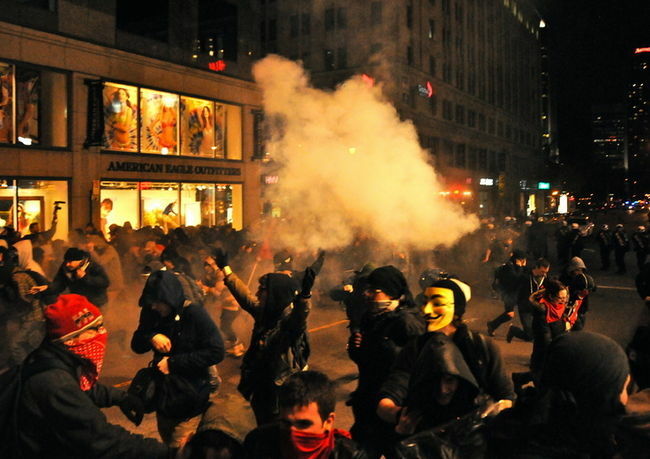 “During spring 2012, Montreal, Canada was the ground of a student strike that took proportions that no one could have expected. For five months the city was the playground of mass protests, riots, wild demos, occupations, actions and sabotages. This revolt saw the participation of many different kind of rebels, activists, angry students, radical politicians, youths, and anarchists. All fighting with different reasons, with different methods and different perspectives. The generalization and the continuation of this revolt to dimensions that go beyond our anarchist predictions and preparation and that confront us with possibilities and situations that touch the beginning of our wildest desires, can be moments of experimentation and daring. But they also bring up questions and critiques that are necessary to think about. Explosions of revolt can happen anywhere and anytime. We do not want to find ourselves in this situation asking ourselves ?what should we do? ?, but we want to take every opportunity to be able to deepen our understanding of possible problematics that can arise from this situation, in order to push our imagination, analysis and practice into creating, expanding and continuing these moments into a time and place where there is not turning back.